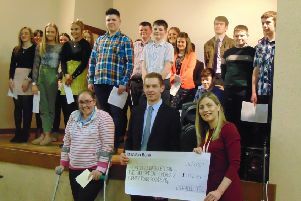 James Speers, president of the Young Farmers’ Clubs of Ulster, has this week announced his plans to hold a fundraising barn dance for Air Ambulance NI. AANI, the local charity, works in partnership with the Northern Ireland Ambulance Service to provide the helicopter emergency medical service for Northern Ireland. The highly anticipated event is open to members of the public of all age groups and will be held at James’ farm on the Keady Road, Co Armagh, Saturday, September 8th 2018. A barbecue will be served up followed by an entertaining evening of music by popular ‘Hit the Diff’ country singer, Ritchie Remo. Speaking about the upcoming event James said: “I am really looking forward to opening up my farm for this barn dance and barbecue which will raise funds for Air Ambulance NI, a charity I have chosen to support throughout my two year presidential term. “This is a unique opportunity for the community to come together and get behind Air Ambulance NI. James added: “Clubs across the length and breadth of Northern Ireland have got behind the fundraising drive. July 22nd 2018 marked the first anniversary of Air Ambulance NI. Over the past year the Air Ambulance has been tasked on 380 occasions, with 10 percent of these calls classified as farm related incidents. Commenting on this statistic James said: “This highlights the extremely important and lifesaving service that the Air Ambulance provides for those living in rural and isolated parts of Northern Ireland. “We are lucky to have a Helicopter Emergency Medical Service (HEMS) that can reach remote farm yards within a matter of minutes. I know that this is a charity that resonates with the entire 3,000 strong YFCU membership base. Tickets are available from YFCU HQ and cost £15 each. Tickets will be sold on a first come first served basis. Alternatively, you can contact James for tickets on 07752421659.